When visitors to the properties of others are injured in California, they may be able to recover damages by holding the property owners liable in a premises liability lawsuit. However, it is important for people to note that just because they might be injured by a dangerous condition that exists on the property does not necessarily mean that they will be able to recover damages. In Jacobs v. Coldwell Banker Residential Brokerage Company,2d Civil No. B277832, the court found that victims who are injured in accidents that are unforeseeable are not able to hold the defendants liable under a theory of premises liability. Issue: Is climbing on a diving board to inspect property over an empty pool foreseeable? In the case, the plaintiffs were being shown a bank-owned home that they were interested in buying as an investment property. The home had an empty swimming pool with a diving board, and the listing agent had noted that prospective buyers should exercise caution around the edges of the swimming pool. Prior to the showing, an inspector had inspected each room of the home, the swimming pool and the diving board, and did not see any problems with the diving board such as cracks or other indications that it was in an unsafe condition. While being shown the swimming pool area, the plaintiff climbed on the diving board so that he could see over the fence because he wanted to determine if trespassers would be able to jump over the fence that surrounded the pool area. While he was standing on the diving board, it broke, causing him to fall into the empty pool. He sustained serious injuries and sued Coldwell Banker under theories of premises liability for failing to fix the diving board or to warn him about it and for general negligence. Coldwell Banker filed a motion for summary judgment, claiming that the company did warn about the empty pool and that the accident was not reasonably foreseeable since the inspection had not revealed any damage. The Superior Court granted Coldwell Banker’s motion, and the plaintiff appealed. On the plaintiff’s appeal, he argued that Coldwell Banker was negligent because of the empty pool, which he had not pleaded in his initial complaint. Rule: In order for a defendant to be liable for an injury that occurs on his or her property, the accident must be one that was reasonably foreseeable. In order to prove that a property owner was negligent under a theory of premises liability, a plaintiff must be able to prove several elements. He or she must first show that the owner owed him or her a duty of care to maintain the property in a safe manner. This duty includes a duty to warn or correct any hazards about which the owner is aware or should have been aware. The plaintiff must then show that the property owner failed in that duty to warn or fix the hazardous condition, and the plaintiff had an accident as a result. Finally, the plaintiff must be able to prove that he or she suffered an injury and financial harm as a result of the property owner’s breach of his or her duty of care. The court will look at whether or not an accident was reasonably foreseeable in determining whether or not the property owner breached the duty of care. If an accident is not foreseeable, then the plaintiff will not be able to meet his or her burden of proof, and the claim will fail. The court first ruled that the plaintiff could not prevail on the empty pool claim on appeal because it was not properly pleaded in the initial complaint. Plaintiffs may not raise new issues on appeal that were not contained in their complaints. The plaintiffs had also accepted the lower court’s ruling granting summary judgment on their claim regarding the diving board. The court also considered whether or not the empty swimming pool claim would have prevailed in a motion for summary judgment if it had been properly pleaded. Generally, an accident is not considered to be foreseeable when the hazard is one that is open and obvious. 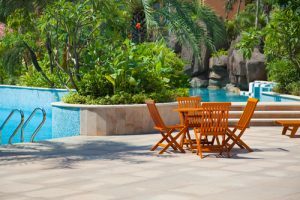 In this case, the plaintiff admitted that he understood that it was dangerous to be near the edge of an empty pool, and the Coldwell Banker listing agent had printed a warning to prospective buyers to be careful around the empty pool. When a hazard is one that is open and obvious, the courts view it as notice of the danger in and of itself. There is an exception to this negation of the property owner’s duty of care for open and obvious hazards if it is foreseeable that a visitor will encounter the hazard out of necessity. In applying this rule to the plaintiff’s appeal, the court found that it was not foreseeable that Jacques would choose to climb on the diving board to look over the fence out of any necessity. The appeals court ruled that even if Jacques had pled the empty swimming pool in his initial complaint, he would not have prevailed. The pool was an open and obvious hazard, and Jacques’s actions climbing on the diving board were not foreseeable as actions taken out of necessity. People may not always be able to recover damages in personal injury lawsuits simply because they are injured by hazardous conditions on the properties of others. They must be able to prove each of the elements, and their injury accidents must have been foreseeable. To learn more about your rights in your case, contact an experienced Los Angeles personal injury lawyer to schedule a consultation.